Happy New Year, guys. I hope everyone survived the Christmas holidays. For you football fans, I hope that your team either won, continues to win, hopes to win, or that you have come to grips with the fact that no matter how much you screamed at the television, the refs, or both, painted your face, wore the colors, donned the rally caps, prayed for a fumble, or all of the above, you had little or no control over the loss and you will live…maybe. For those of you who are not football fans, it is absolutely okay. In fact, you just may be better off than those of us who are. Back to the matter at hand. It’s January and the start of the New Year. We have the perfect opportunity to make this year all that we wanted last year to be. If last year was everything you wanted, great. Make this year even better. If last year was less than optimal, what caused the wheels to come off? Where did it happen? What road lead you to a place that perhaps you shouldn’t have been? What left did you take when right was the way to go? Did you lean on your own sense of navigational ability or did you use a GPS? And if you used a GPS, did the “G” stand for “global” or “God”? Was the device a Garmin or a Bible? How did you get to where you are? Are you catching a theme here? Many of us remember the days of road trips. And many of us still enjoy them. Perhaps in a different way than before but enjoy them nonetheless, we do. Oh, the stories we have and will never share no matter how many bamboo shoots are shoved under our finger nails or how many times you make us listen to Milli Vanilli! Ouch! And the bamboo would hurt, too. Some of my greatest memories and most embarrassing, exhilarating, joyous, scared, spiritual, inspired and tragic moments happened during some type of excursion. I am sure many of you can relate. While memories were certainly made and experiences realized once a destination was reached, often the trip began with no particular destination in mind at all. You simply gathered the guys together (sometimes ‘gathered’ was the operative term as late night extractions were not uncommon), made the announcement, jumped in the car (or were thrown into the car as a result of the extraction), and went. It was all about the trip…the journey…the ride. friends. Confusion has set in, hasn’t it? You’re thinking, “I completely get the ‘If I have a destructive or bad habit, my priorities are whacked, or if I have friends that lean toward the rough side that I need to make a change.’ But, if the above mentioned “safe places” are not necessarily bad, destructive, some may even be good, why would I want or need to leave them?” Bottom line: If something – a safe place – is keeping us from what God has in store for our lives, regardless of whether it’s good or even if we think it is, it’s dirt we need to shake. Don’t misunderstand me here. I’m not telling anyone to leave a job, a commitment, or a family. Far from it. I’m saying we need to remove the governor from the engine and let it fly. We need to blow the cobwebs from the carburetor and experience God’s highway of blessings! The cool thing is, when we go out on our road trips, we get to come back to that safe place. We get to come back home. Often the experiences we have on the road have a significant impact on how we view things…some positively…some negatively. But there’s no way we aren’t changed in some way by what we experience as a result of being on life’s highway. Guess what guys? We are going on a road trip. Throughout 2011, we are going to look at things from life outside the house. 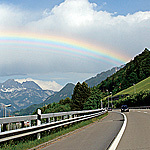 We are going to look at life “from the road”. We are going to challenge some perspectives. We are going to face some hard truths and hit some things head one…figuratively, of course. We are going to be real, relevant, relentless in our pursuit, and definitely Jesus Freak’ish radical. And we are going on this trip together. Are you with me? I’ll be honest with you. There’s a lot that I need to work on. I need to work on being a better husband, a better dad, a better servant, a better follower of Christ. I know that if I focus on the latter, the former will have a much better chance of happening. It has to be less about me and more about Him. But I also know I can’t go at it alone. And why would I want to? It’s just like with a road trip. It could be done as a solo venture but where’s the fun in that? The best part about any excursion is who’s with you on it. So…Come on. Let’s go. I’m not sure when we’ll get back but I can tell you it will be a trip for the ages. Get in and buckle up. By the way…“Are we there yet?” Sorry. I couldn’t resist. Keep it real.